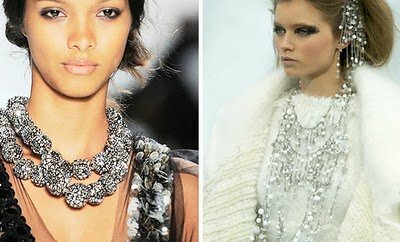 For some time we've watched the trend of a "bib" necklace turn into the STATEMENT necklace.This season accessories are bold statements, medallion pendants, cutting edge, gemstone necklaces (real or faux). This necklace not only, single handedly, boost a plain-jane dress into a WOW dress, but makes a statement. I find this statement to be very classic, as this necklace is chic long, short, embellished or layered. You can turn a day time look instantly to night, and transform you in your fave LBD into hollywood gold! More is MORE this season with chunky jewelry trends! Where can you get this Statement Necklace?? For our girls on a budget, GirlProps.com, ShopBop.com or your local boutique's and thrift shops may offer you timeless jewelry at a reasonable price!